What’s been my experience so far interacting with Street Epistemologists? Let’s talk about it on Deeper Waters. I was asked by an apologetics group I belong to to describe what has been my experience thus far dealing with street epistemologists. You see, I was thrilled when I heard Peter Boghossian, author of “A Manual For Creating Atheists” (which I have reviewed here and interviewed Tom Gilson on here) had decided to come out with a show called the Reason Whisperer where he plans to have live conversations with people of “faith” and get them closer at least to deconversion. I think this is a Godsend really. I’ve long been waiting to see if there is something that will wake up the church from its intellectual slumbers and this I hope is it! We’ve had more than enough warnings and yet too many Christians are too caught up in themselves to realize they’re to do the Great Commission. So I wanted to see what these street epistemologists were made of. Myself and some others with the same interest went to the Facebook page of Peter Boghossian. There we began asking questions and challenging what was said. It’s noteworthy that Boghossian himself never responded to us. In fact, one post at least was a practical dare on Boghossian’s part when he linked to Misquoting Jesus by Bart Ehrman and said the apologists won’t post on this one. He sure was wrong! More of us posted than ever before! I’d like to report on how that has kept going and that Boghossian is being answered every day, but alas, I cannot. Why? Because he banned us all. What I did find from the interactions I had is that street epistemologists are woefully unequipped. They read only that which agrees with them. They will buy into any idea if it goes against Christianity. The Earth was believed to be flat? Sure! I’ll believe that! Jesus never existed? Sure! I’ll believe that! Not having the originals of an ancient document is a problem? Sure! I’ll believe that! I still think about the person who recommended I read “The Sacred Mushroom and the Cross”, a book so bad that even the publisher apologized for it. For street epistemologists also, science is the highest way of knowing anything. Now this is something understandable. If matter is all there is, then the best way to understand the world is to use a process that studies matter specifically. The problem is science can never determine that matter is all that there is any more than it could have determined that all swans were white. Science is an inductive process and while one can be certain of many of the claims, one cannot say they have 100% certainty. Edward Feser has compared the use of science to a metal detector at the beach. Let’s suppose I was looking for a treasure map I’d heard had been buried at the beach. I go all over the local beach with a metal detector and say “Well I guess the map isn’t here. The detector never pointed it out.” Sure. I found several other objects that had some metal in them, but I never found the treasure map. You would rightly think this is bizarre. After all, a map is made of paper and while a metal detector does a great job of picking up objects that are metal, it simply will not work with paper. This is not because a metal detector is a terrible product. It is because it is not the right tool for the job. So it is that in order to determine if matter is all that there is or if there is a God, science is not the tool for the job. Now some might think science can give us some data that we can use, but it cannot be the final arbiter. Yet for street epistemologists, it seems enough to just say “Science!” and that rules out everything else that’s religious. This would be news to many scientists who are devout Christians and see no disconnect between science and their worldview. Yet here, the street epistemologists once again have an out. It is why I in fact call them atheistic presuppositionalists. They will simply say that these people are experiencing a kind of cognitive dissonance. They are compartmentalizing themselves and not seeing that their worldviews contradict. This would be news to someone like Alister McGrath, Francis Collins, or John Polkinghorne. As I said, these only read what agrees with them. They will read Bart Ehrman on the Bible, but they will not read Metzger or Wallace in response. They will read Boghossian and follow him entirely, but they will not bother to read his critics. They will read about how people in the Middle Ages thought the Earth was flat, but they will not read James Hannam’s book on the matter, see Thomas Madden’s scholarship there, or even read the atheist Tim O’Neill who disagrees with them. Street epistemologists will also go with extreme positions. They will tout on and on about how Jesus never existed and only say “Richard Carrier” or “Robert Price” in response. They will not acknowledge that the majority of scholarship, even scholarship that ideologically disagrees with Christianity, says it’s certain that Jesus existed. They do not realize that biblical scholarship is an open field where anyone of any worldview can join and writings go through peer-review. Interestingly, these same people will go after Christians for not believing in evolution because, wait for it, there’s a consensus that this happened! The consensus of scientists is to be trusted. The consensus of scholars in the NT and ancient history is not to be trusted! Also, if you do not hold to their view, well you are obviously emotional in nature in some way since you only believe because you want to believe and because of how you feel. It never occurs to some people that there could be intellectual reasons. In fact, it follows the pattern that if they don’t think the reasoning is intelligent, then it is just emotional. It’s in fact a direct contrast to what is often said in many religious circles. “Well you’re just living in sin and are blinded to the truth.” Now I don’t doubt for some atheists, they don’t want to give up an immoral lifestyle. Also, I don’t doubt that for too many Christians, their only basis for being a Christian is how they feel and an emotional experience. Both of these groups have reached their conclusions for the wrong reasons. Yet psychoanalyzing is seen as an argument to street epistemologists. If they can say you just believe for emotional reasons, then they can dismiss what you say. Note that it is dismissal. It is not a response. I consider this a form I see of what I call atheistic hubris. Note please as well that this does not mean all atheists are this way. It just means that there’s a sizable portion of what I call “internet atheists” that are this way. The idea is that if someone is an atheist, then they are rational and intelligent. Therefore, all their thinking is rational and intelligent and all their conclusions are rational and intelligent. The reality is we must all be constantly watching ourselves and one of the best ways to do this is to read our critics. Our critics will show us our blind spots and if we are wrong, we are to change our minds accordingly with the evidence. An excellent example of something Boghossian and others constantly get wrong is faith. Boghossian says it is believing without evidence or pretending to know something that you do not know. Now in a modern vocabulary, I don’t doubt this. Too many Christians use faith this way and treat this kind of faith as if it is a virtue. It isn’t. The question is, when the Bible uses the word faith, does it mean this? The answer is no. In all of the writings I’ve read by the new atheists speaking this way about faith, not one of them has ever consulted a Greek or NT Lexicon in order to make their case. They have just said that this is what the word means. Oh they’ll sometimes quote Hebrews 11:1, but a text without a context is a pretext for a prooftext. I have also given my own exegesis of what the passage means here. Also, I do have another great source on what faith is. As it stands, the most I get told to this is that it is an appeal to authority, which indicates that street epistemologists don’t even understand the appeal to authority. Strange for people who claim to champion logic. Sadly, they’re just following in the footsteps of Boghossian himself. Boghossian’s techniques will not work for any Christian who is moderately prepared to defend his worldview. It’s a shame that he who teaches so much about doxastic openness is so often incapable of doing what he teaches. I conclude that if this is what we can expect from street epistemologists, then we really have nothing to be concerned about with them. Street epistemologists are just as unthinkingly repeating what their pastor, in this case Boghossian, says to them, as the fundamentalist Christians that they condemn. They are really two sides of the same coin. 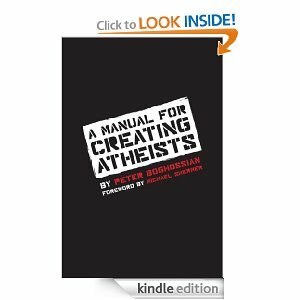 What do I think of Peter Boghossian’s book on creating atheists? Let’s talk about it on Deeper Waters. Boghossian’s book in the past month or so has been the subject of great conversation on the internet. Why is this the case? Is it because there’s a new argument in here? No. There’s nothing new. Is it because there’s a really powerful demonstration of atheism in here? No. That’s not here also. It’s because now, Boghossian claims to have a way to apply principles of critical thinking and train others in them so that they can become “street epistemologists” with the goal of deconverting others. Unfortunately, what I’ve seen is that these epistemologists are thoroughly unequipped for the job, and it’s no surprise because the apple has not fallen far from the tree. And yet at the same time, I found great confirmation for so much of what I’ve been saying for years. I have for years been correcting Christians on their definition of faith. I have been telling them that their testimonies will not be persuasive to many skeptics out there and to avoid emphasizing their feelings, and in fact I’d prefer they not discuss feelings altogether. I’ve also been encouraging them to study, and not just the Bible, but good history and philosophy and any other field they have a passion for. Well now those proverbial chickens are coming home to roost. In fact, Boghossian wants to start a show called “The Reason Whisperer” where he will show conversations with the faithful seeking to deconvert them. If this show takes off, I have high hopes that he will come to my church. I really want to see that. Therefore, Boghossian has the deck stacked in advance. Want to make a statement about faith? The street epistemologist is to read it as saying one of the two things Boghossian says it is. There is no concept that perhaps the other person might have a different definition. Perhaps the other person has done proper exegesis and study of the Greek word pistis to show that it more accurately refers to loyalty in the face of evidence that has been provided. Boghossian regularly sees faith as a way of knowing. It is not. No one should know anything by faith. Faith is rather a response to what has been shown. The medievals would hold, for instance, that you could know that God exists on the basis of argumentation that was deductive, such as the five ways of Aquinas. They held that you believed that God was a Trinity, since this could not be known by reason alone but required trust in revelation. You can know historically that Jesus died on the cross. You believe that He died for your sins on that cross. Unfortunately, Boghossian does not have any understanding of this and this straw man runs throughout the whole book. As soon as any street epistemologist comes across anyone who knows better, then they are caught in a bind. It is a shame also that Boghossian insists that these are the definitions of the word, since he is the one who encourages practicing “doxastic openness” which we shall get to later. Boghossian gives a brief look at the resurrection which starts off with saying that it is assumed that a historical Jesus existed. For atheists who always want to talk about evidence, it amazes me that so many of them buy into this Christ-myth idea. To go to studies of ancient history and the NT and say Jesus never existed is on par to going to a geologist convention and telling them that the Earth is flat. Boghossian says even if you grant the burial and the empty tomb, there are all number of ways to explain it, including the theory of space aliens. All of them require faith because of insufficient evidence. Any interaction with a Habermas, Licona, or Wright in this? Nope. We should ask Boghossian what methodology he took to arrive at this conclusion. By what methodology should street epistemologists accept it? Will it be a faith claim? On page 28, Boghossian says that not a single argument for God’s existence has withstood scrutiny. He lists the five ways of Aquinas, Pascal’s Wager, the ontological argument, the fine-tuning argument, and the Kalam. He is emphatic that these are all failures and has an end note for that. So when you go there, what will you find? Will you find a listing of works where these arguments were refuted? No. Will you find descriptions saying why these arguments are problematic? No. What will you find? A long statement on epistemologies? On what grounds am I to believe these arguments have all been refuted? Boghossian’s say so? Is that the way a critical thinker should work? Boghossian also says believers are told that ignorance is a mark of virtue and closeness to God. Sadly, I’m sure this is the case for several. In reality, if this is the Christianity Boghossian wishes to take down, more power to him there. I’ve been trying to take down this kind of Christianity for years. It has nothing to do with what Jesus taught and what the church has defended intellectually. Several decades ago in fact, the church was repeatedly warned the greatest threat to the church was anti-intellectualism. It is at the end of the third chapter that we start seeing interventions, these are dialogues that Boghossian tells us about. The only one worth mentioning is a professor at an evangelical university who goes unnamed. Unfortunately, we have no idea what he teaches so I don’t know why we should take his opinion seriously. Most of these interventions consist of talking to people who I have no reason to believe are informed on their faith. It’s a reminder of what Bill Maher did in Religulous. It is like saying to tune in when a bodybuilder takes down a little old lady in a street fight. Also in this chapter, he talks about doxastic openness. Closure is when someone is impervious to a reasoned argument and will not change their beliefs. The sad reality is this is a good description of street epistemologists and as we will see later on, Boghossian himself. I fully think we should all be open to seeing if our beliefs are wrong. It is why I, as a Christian, have changed my stance on numerous issues over the years. This is something quite simple to do when your positions are based on evidence and argumentation. Interestingly, one of his strategies in this chapter is to avoid facts. This strikes me as odd. If I am supposed to change my worldview, aren’t the facts relevant to that? Boghossian says that if people believed on the basis of evidence, they wouldn’t be where they are today. Isn’t this part of the doxastic closeness that he earlier condemns? Could it be the evidence just might be on the side of the Christian. Maybe I’m wrong on that of course, but should we not be open? Boghossian says it is how we arrive at our conclusions that matter. Now I do agree this is important to discuss. Yet I tell people I am an empiricist. Knowledge begins with sense experience. I use that to reason to God. (Say the ways of Aquinas for instance.) Then with history, I try to read the best scholarship on both sides of the issue in forming an opinion on what happened to Jesus. I am also actively reading what I disagree with, such as Boghossian’s book, to see if I might have missed anything. Does Boghossian fault that procedure? Now Boghossian could say my conclusion is reached in advance and I have confirmation bias, but that needs to be shown rather than just asserted. The best way to show it if my methodology is sound is to show how I am not following it properly and that is done by looking at the evidence. It is amusing to see him say Gary Habermas reached his position by starting with the divinity of Christ and the truth of Scripture and reasoning backwards. Anyone who has heard Habermas speak on doubt before knows that this is not the case. Knowing him personally, I have heard far more than most readers I am sure and know about the hours he spent agonizing over questions and not being wiling to commit to Christianity. He was quite close to being a Buddhist in fact. It is a wonder where Boghossian gets his information then. Did he just assume it? Has he taken a faith position? For example, let’s suppose there was an atheist who held to his atheism for known emotional reasons. Let’s suppose these were reasons such as he grew up in a fundamentalist Christian home and hated his parents and everything to do with Christianity. Let’s also suppose he wants to sleep with any girl he meets and knows that Christianity would require him to give that up. This man has reasons to want to be an atheist that can cloud how he views the evidence. I don’t think anyone would doubt this. Does that mean that he’s wrong? No. The only way you know if he’s right or wrong is by looking at the evidence. Yes. This is from the one who says we should practice doxastic openness. What does this mean? It means formulating an argument for God’s existence will not work with Boghossian. What he requires for himself is a personal experience, and even then a grand personal experience is only suggestive. Why should anyone attempt to reason with someone like Boghossian who says the arguments won’t convince him but that it will require a personal experience? Shouldn’t we go with the arguments instead of personal experience? The sixth chapter spends much on interventions, including arguments over a topic such as if the universe had a beginning. Boghossian has this idea that an eternal universe would mean no God. I, meanwhile, say I’m willing to grant an eternal multiverse. What is needed is to explain not just its existence but its act of existing. Seeing as I plan to focus more later, I’m going to move on to chapter 8, because in many ways I found this an excellent chapter. I really appreciated Boghossian’s viewpoints on relativism and the modern definition of tolerance being bogus and the problem with adding “o-phobia” to something. Boghossian is certainly right that ideas need to be open to criticism and if he says “faith ideas” need to be open, I fully agree! In fact, I am one who goes out in public really hoping someone will see me reading a book by an atheist and think I’m one and try to talk me out of it, or see me reading a book about the resurrection of Jesus and try to talk to me out of that. I have always said that I want us to just come together and discuss the evidence and let Christianity work in the marketplace of ideas. Which case should we go with? Whoever brings forward the best arguments and evidences. I also agree with what is said about faith-based claims. Those students who stand up in class and have nothing else to say except “The Bible says” are a sign of a problem that we have. It is not a problem with the Bible, but with a claim on how Christian education is done. It has too long been made that Christians are just told what the Bible says. Say anything about why you should trust the Bible? Nope. Say anything about worldviews that oppose the Bible? Nope. It’s part of what I’ve called the escapist mentality. In fact, that’s what’s so ironic about Boghossian’s book. There is much in there that I could agree with generally on reasoning, and ironically, much of the attitudes that he sees in the faithful are the same attitudes that I see in the faithless. The atheists I meet more often than not have a hubris built into them where they think they are rational and right by virtue of being an atheist. I will also not deny many Christians have that same mindset to them as well. As I plan to write on this further, I will conclude at this point by saying that Boghossian is someone to take seriously, not because he has new information, but because he is an evangelist for atheism that is seeking to make other evangelists. Boghossian would say someone like me is upset about a show like “The Reason Whisperer.” On the contrary, I am thrilled about it. I adore it whenever something like this happens. The Da Vinci Code, The New Atheists, and now this. Hopefully more and more soon the church will wake up and realize it needs to get up and do something and actually start learning what we believe. I think a show like this could be the shot in the arm the church needs. Of course, if the church does not wake up soon, I think it will only be around for about another generation or so in America. The reality is the arguments are still simple to deal with and the street epistemologists are thoroughly unequipped in their quest. The problem on the side of the church is not lack of information. The problem is desire to have that information and awareness of the problem a lack of information causes. When someone abandons the life of the mind, it is sad. When a Christian does it, it is a travesty.